Summary: When your cargo is 600ft long, you need a special type of wagon. The YEA wagons were part of an ingenious system designed to handle lengths of continuously welded rail, with the ability to unload single rails at work sites. The sets include components classified as on-track plant and the concept was obviously sound as new wagons built from 2002 shared the same configuration. History: The introduction of long-welded and continuously welded rails on BR lines has undoubtedly improved the ride for many passengers but it also presented some logistical challenges. How exactly do you move and unload 600ft long pieces of metal? An early solution was to strip the bodywork off former EMU coaches and fit rollers and loading chutes at one end of each rake. 34 such conversions were undertaken in 1970, the vehicles being renumbered DB975500-DB975533 and named either Manta or Marlin. A more high-tech solution appeared in 1982 when Cowans Boyd built the first LWRT (Long Welded Rail Train), the individual wagons being coded YEA. The LWRT concept is relatively simple, but surprisingly difficult to describe. The main portion of each train was made up of nine flat bogie wagons (fishkind Perch), all of which had a rail fitted to the top of each solebar. Hinged sections of rail were fitted at alternate corners and could be unfolded to rest on the adjoining wagon making a continuous rail on each side. Specially shaped buffers were fitted to enable the rail to clear them. The wagons also had banks of rollers on which up to 24 long-welded rails could be carried. The flexibility of the load meant that the train could travel on normal curves even when loaded. One intermediate wagon in each set was fitted with clamps to secure the rails whilst in transit. At one end of the train was a chute wagon (fishkind Porpoise). This had a large cab at the outer end and a narrow central spine. Either side of this were chutes that sloped down to just above rail level and there were also telescopic guide arms to enable rail to be unloaded either between the running rails or outside. The back of the cab was fitted with an operator�s position with windows overlooking each chute. At the other end of the train was the stabling wagon (also Perch), this being similar to the normal flat wagons but fitted with a small cab at the outer end. This was used to stable the gantry unit when not in use. The gantry unit was what made these trains work. This slightly resembled a portal crane and was designed to run along the rails mounted on the wagons. Hydraulic arms at one end were fitted with clamps which could grip a rail. The whole train would then move slowly forwards, while the gantry unit moved along the train backwards, effectively remaining still. The rail being unloaded would move across the banks of rollers and down the chute to the ground. Four sets were built by Cowans Boyd in 1982/1983 followed by four power wagons coded YXA in 1984. These resembled the normal flat wagons but were fitted with a diesel engine and allowed the trains to operate at a work site without an attendant locomotive. The bogies on the power wagons appear to have been based on the Gloucester GPS type, while the other wagons were mounted on Y25 bogies (both fabricated and cast types having been noted). The numbering of the wagons was somewhat complicated. The inner wagons were numbered DB979000-DB979035, the chute wagons were DB979500-DB979503 and the stabling wagons were DB979600-DB979603. The gantry units were given numbers in the CEPS series as DR89100-DR89103, while CEPS numbers DR89200-DR89203 were also allocated to the chute wagons. It is worth noting that the un-powered wagons were built in BR Workshops (Shildon and Doncaster), while Cowans Boyd (and later Plasser) built the power wagons, gantries, cabs and clamping and roller units. This may account for two numbers being applied to what was effectively a single vehicle. When the power wagons were added, these were also numbered in the CEPS series as DR89000-DR89003. Livery of the train was black wagons with yellow cabs, gantries and roller banks. A further order for 12 trains was split equally between Cowans Boyd and Plasser and Theurer, and these were built in 1985 complete with power wagons. These followed on the same numbering sequences except that it was decided to create a new series for the clamping wagons, these initially being DB979400-DB979411. 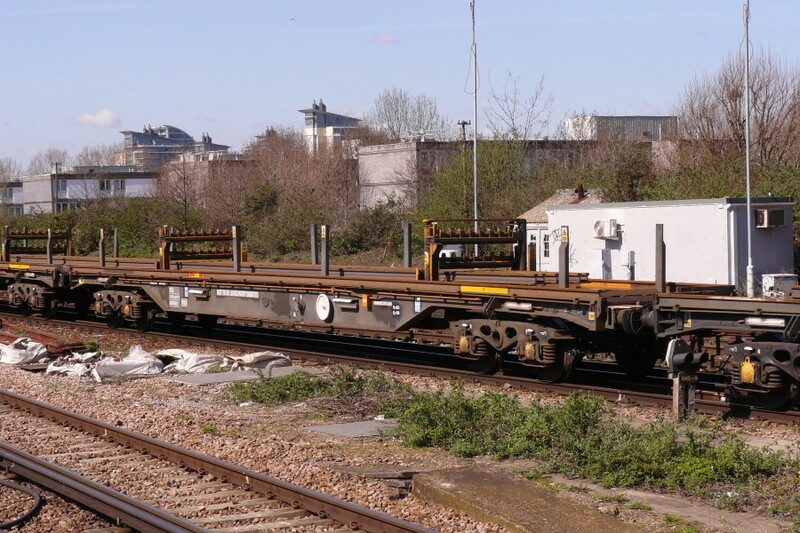 On delivery, the first of these sets would therefore have comprised gantry DR89104 on DB979604, 4 intermediate wagons (DB979036-DB979039), clamping wagon DB979400, 4 more intermediate wagons (DB979040-DB979041), power wagon DR89004, and chute wagon DR89204 on DB979504. A number was used to identify complete sets (eg LWRT4), so it was decided to renumber the clamping wagons to match. It was intended that the original clamping wagons be renumbered DB979400-DB979403 (from DB979025, DB979004, DB979031 and DB979011), and the second batch DB979404-DB979415 (from DB979400-DB979411). This plan was only partially carried through, and three of the first batch still carried their original numbers in 2000. DB979405-DB979411 correctly became DB979409-DB979415, but the only other renumbering was DB979402, which became DB979408 instead of the planned DB979406. Numbering anomalies aside, the sets saw plenty of use through the 1980s and 1990s, being allocated to all regions. In operation, it was fairly common to see incomplete sets. 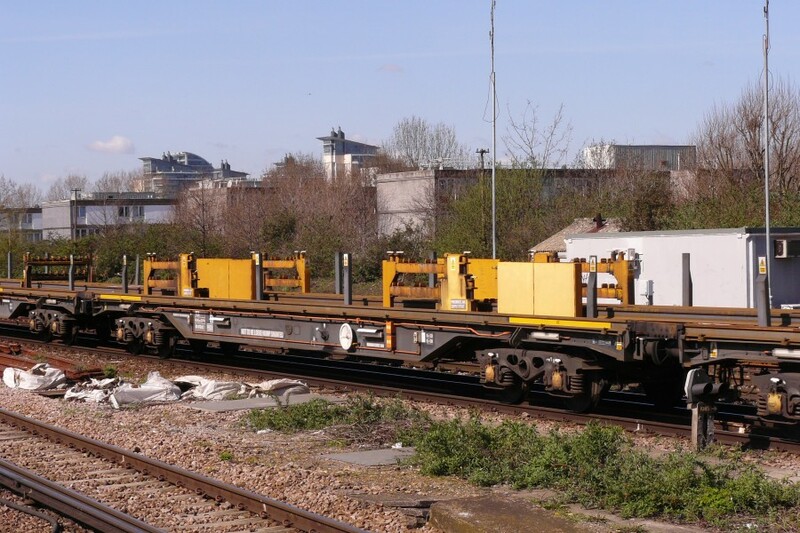 A rake of nine intermediate wagons (including one clamping wagon) could be used to transport rails on their own, either where loading equipment was provided (as at British Steel Workington), or whilst in transit to a work site. The three special wagons (stabling, power and chute) would have been maintained at plant depots and could often be seen either travelling separately, or marshalled together at the end of the intermediate wagons. In such cases, a bit of shunting would be required before unloading could take place. When these trains were sent for loading from the Southern region to Castleton, initially the whole train of vehicles were sent. For a couple of reasons however the practice of removing chute power and stabling wagons before sending the train off region was adopted. Firstly, the plant vehicles were highly susceptible to being vandalised in the Castleton/Manchester area, burnt out/vandalised stabling and chute wagon cabs, stolen radios and equipment being common problems when the trains returned back from loading. Secondly, the chute wagon on Plasser trains had a cunning brake valve mechanism that isolated the trains self propelled braking system and allowed loco haulage of the set. If this valve was left in the wrong position and remained unoticed, the train could be hauled all or part of the way to Castleton with the chute wagon brakes on, resulting in severe wheel flats, costly repair bills and delays to operations. For these reasons and also to allow planned maintenance of the plant vehicles, they were increasingly detached prior to sending the trains for loading. Although this resulted in additional shunting moves it was worth it financially. Later on unfortunately, the Plasser power wagons developed a rather unreliable reputation for blowing hydraulic seals in their traction system. Once this occurred, the train was effectively disabled and if part way through a job, would have to be loco assisted to complete unloading. The Southern trains were all maintained at Wigan on a 12 monthly basis with PPM done locally at Plant Depots. The chute wagon unloading arm had attached to it a rail 'thimble' through which the unloaded rail passed before being lowered to the ground. This mechanism of rollers was colour coded with a yellow one being for flat bottom rail and a blue one for bull head rail. The Southern had to modify their trains to allow for the carriage of conductor rail also, this meant additional white 'thimbles', gantry arm 'nips' and clamping wagon fixtures to cater for the different profile of conductor rails. 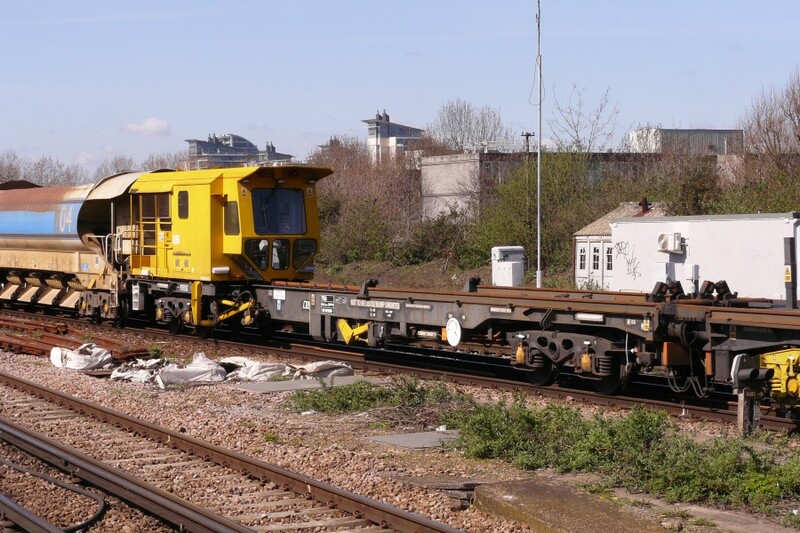 When I was a shunter at Guide Bridge depot, we used to call the stabling, gantry & chute wagons the 'primary set' and the rail carrying set the 'perchs'. Sometimes the whole twelve wagons would arrive with the chute wagon facing the wrong way when going to the rail drop site. It was a case of detatching the primary set, piece them back together, then turn them on the triangle at Guide Bridge. Once back in the yard they had to be separated and pieced back together with the perch set. Simple as sounds, it could take 90-120 mins to complete this task as we had to wait for a path on the mainline ! Incidently, the twelve wagon consist was the same length as 23 YGB/H and only just fitted onto 9 & 11 roads in the yard - precise stabling required ! By 2000, three of the gantry units had been withdrawn, the stabling wagons (DB979601, DB979610 and DB979615) being modified as intermediate wagons and renumbered DB979132-DB979134. 2002 saw the introduction of a new set of wagons that used a similar principal. 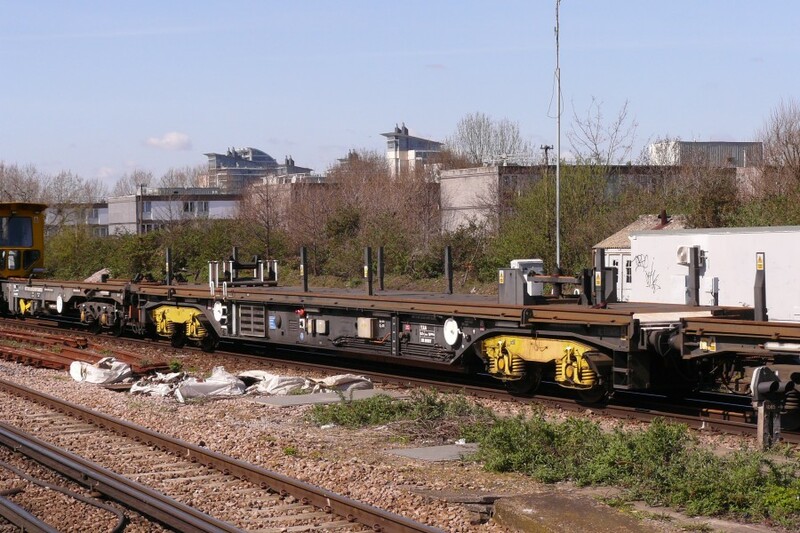 They differed in being modular, such that the clamping and roller banks and the gantries (now referred to as manipulators) were mounted on what were essentially container flat wagons. They also carried a revised livery, being cream with green bogies, and were numbered in the private owner series (for example JZA clamping wagons NLU93600-NLU93619. No new chute wagons were built however, and 8 of the existing chute wagons were modified to work with the new sets. These were repainted cream and had new, smaller cabs fitted. They were also curiously given private owner prefixes to their �railway-owned� numbers, becoming NLU979500 etc. It appears that 8 of the original sets continued to see use with the remaining chute wagons. In 2001 trackwork contractor Fastline took delivery of the Rail Recovery and Delivery Train (RRDT) that can also load and unload long-welded rail. However, this is achieved using a series of fixed, wagon-mounted cranes rather than a travelling gantry. It is worth mentioning that a similar configuration of a crane travelling along a train on rails fixed to wagons had appeared in 1981 when Plasser built a skip handling train. 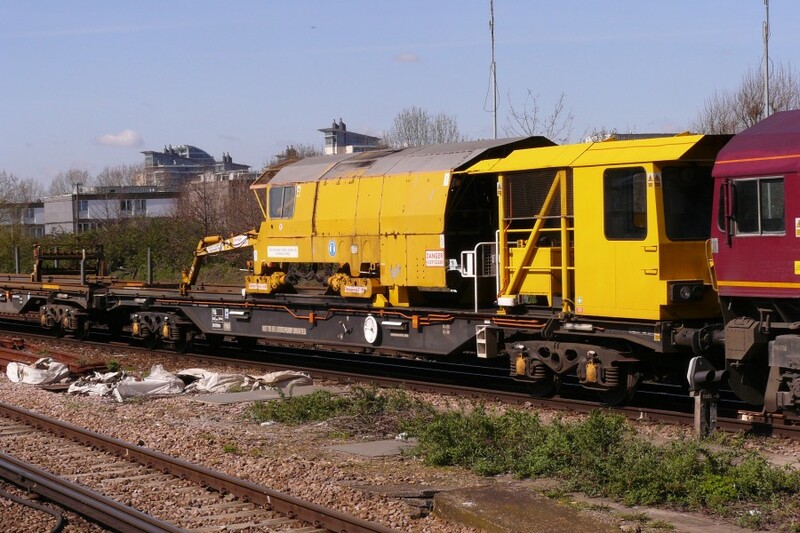 This was intended to work with ballast cleaners and used skips, similar to those carried by lorries, being moved by four gantries working in relay. 22 flat wagons were included but the train was not a success and all the vehicles were soon withdrawn. 30/01/2009: Operational notes from Andrew P added. 26/07/2009: More operational comments, this time from Kevin C.
13/04/2010: 6 new photos added. YEA chute wagon DB979511 at Eastleigh, 22nd August 2005. YEA stabling wagon DB979611 with gantry DR89111 at Eastleigh, 22nd August 2005. 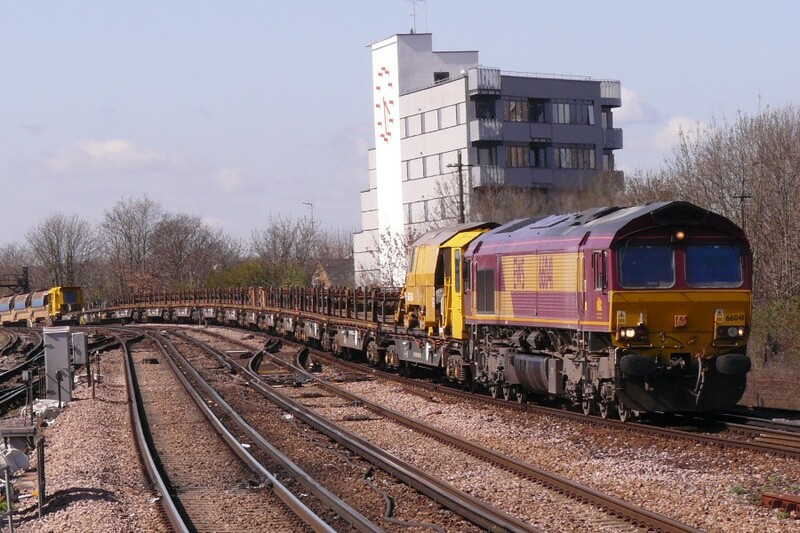 A complete CWR set approaches Clapham Junction on 8th April 2010. YEA stabling wagon DB979614 with gantry DR89114. YEA end 'intermediate' wagon DB979017. YEA chute wagon DB979509 with cab DR89209.